Let's Talk about a Good Guy, Ever Heard of JJ Watt? After my two previous blog posts (the first was about Ndamukong Suh's nasty on the field behavior, the second about the NCAA's refusal to pay college athletes a fair wage), one would think I am full of sour grapes and rotten tomatoes. I am here this week to say, thats just not so. There are good guys and bad guys, its just the way it is and while some deserve the right to wear their team's uniform day in and day out, others should be forced to hang them up. But my feelings are sometimes mine alone. After my diatribe about Suh, one Facebook follower commented: "you sir are an idiot". Well at least he called me, "sir". So as we wrap up week 4 of the 2013 NFL season I thought it would be both fitting and worthwhile to explore the idea of "good", as in "Good Dead", or "Good Guy". At the end of the day, isnt that what we all want? A team filled with great men or women or kids, who play fairly, become great at their game using their god given skills and drive the level of competition to new heights. Look, I understand that every narrative needs a villan, and yes, guys like Suh play that role very well, but is it so bad to root for the good guys? Like a guy named JJ Watt? I was flying back from Chicago this past week, falling in and out of a dream state as the pressurized cabin brought my oxygen level down just enough to ease me into a dull dream about work, customers, my family and schedule. I was flying JetBlue, the worlds best airline, and I of course had my headphones in. The TV was tuned to ESPN when they started to run a mid-day piece on JJ Watt. I must admit I didn't know as much as I feel I should have about Mr. Watt; like the fact that when he was drafted 11th overall in 2011 by the Texans the fans booed the choice. During his first season, he was commonly booed and taunted by the home crowd as they displayed their dislike for Watt and their desire for him to be traded. So what does Watt do? Does he hand in his uniform? Does he hide his head in shame and accept the fate his new home town fans have handed him? 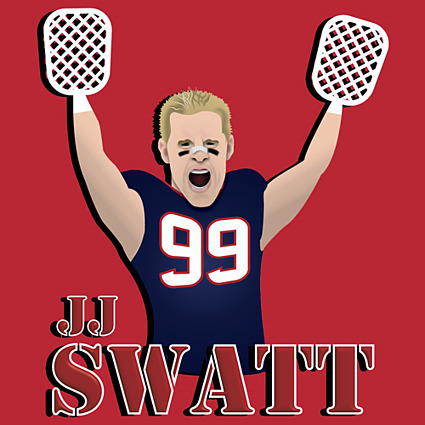 Or does JJ Watt rise above the crowd, ignore the noise and focus on what he can really control: his ability to make great plays, to out-work and out hustle the other guys on the field and to win the hearts and minds of fans both in his community as well as within the broader NFL? If you guessed overcoming his obstacles and moving to greatness, then you guessed correctly. Despite the crowds hissing at him during home games, Watt finished his first two seasons with a total 137 tackles and in 2012 became the first NFL player in history to record 16.5 sacks and 15 tipped passes in a single season. On the way to this performance, he was affectionately nicknamed "J.J. Swatt" for his game-breaking ability to swat passes down at the line of scrimmage. JJ Watt overcame his personal obstacles and won the hearts and minds of his hometown fans, but he didnt do it just playing football. JJ also has a heart as powerful as the hits he puts on slow- and fast-moving quarterbacks alike. When he heard that a young local fan was recovering from cancer and couldn't attend classes with the rest of his peers, Watt surprised the young fan with a day long visit. In doing so, he restablished the trust that professional players should look to earn between fans, kids and their parents. Did Watt get a ton of positive PR exposure from the charitable act, sure. Were the cameras there ready to video the event to be broadcasted for the whole world to see? Yes. But sitting there on my flight home after a week away from my wife and kids, I felt the power of something that JJ Watt delivered to that young fan. The power of identity, of feeling at home, of being a part of something greater than yourself and the willingness to open your mind and heart about the possibilities of a bigger picture. So go buy his jersey.